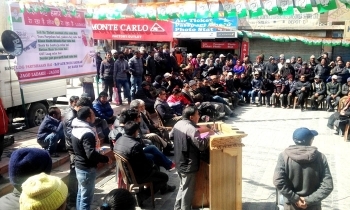 Highlighting the issue of ever increasing airfare to Leh, District Congress Committee staged a protest on March 9 at Balkhang Chowk, main market, Leh. Ladakh remains cut off for almost 6 months in winter with other parts of the country due to the closure of National Highways. The airways are the only way to get in and out of the region. And it is during this time the demand for air ticket increases resulting in charging heavy amount for a passenger travelling. The tickets for just a 45-minute flight are charged in several thousand. Air tickets from Delhi to Leh touched almost ₹15,000 to 30,000 per ticket and ₹20,000 to 35,000 from Jammu to Leh. For flights on March 14, the fare was ₹16000 to Leh whereas, on the same day Delhi –Bangkok was ₹10,000. Many Ladakhi highlighted the issue social media and mentioned that travelling abroad is much cheaper than to travel Leh. Addressing the gathering, Rigzin Spalbar, Former CEC, LAHDC said, “Airfare is the burning issue among the people of Ladakh and the section of the society such as students, patients and pilgrims are facing hardships due to this". “Heavy airfare is not a new thing it has been a very long pending issue. In 2014, under the chairmanship of Secretary Civil Aviation, a meeting was convened in Delhi. I along with the representatives from State, Army, Airforce and the concerned officials were present. In the minutes of the meeting, capping of the price to ₹2500 per ticket, patients who had to book 3 seats will only bear the cost of 1 seat was stated. I have given all the papers to the ruling government to do a follow-up and work on it but no initiative and effort is seen”, he added. Rigzin Spalbar said that it is the responsibility of the ruling party to solve the issue and problem faced by the people who gave votes during the election in the name of UT status as promised by the BJP. He said the growing issues of the people of Ladakh are not being considered or solved. Either the leaders are not concerned or the BJP at the state and center is neglecting or least bothered about the people of Ladakh. The speakers of the opposition party slammed BJP Government for all the fake promises and accused of misleading people in the name of development. The party questioned about the popular nationwide slogan ‘Acchey din’ and ‘Sabka Saath Sabka Vikaas’ of the BJP government when the people are facing hardship because of ration scale reduction, price rise of LPG cylinders and essential commodities, the implication of GST and many other things. The problem of airfare persisted in the region from the past many years and ever since different stakeholders staged a protest against the issue at the various platform. Innumerous copies of the memorandum were submitted, rallies were conducted but the constant struggle for the demand was left unseen and unheard thus ending up with no result. Maybe we need a strong and serious move from all our leaders and unite to bring a solution for this long-standing demand. The government can’t turn blind eye for so long now. The UDAN (Ude Desh Ka Aam Nagrik) scheme initiated by the Government of India in the year 2017, aims at making air travel affordable to the common citizen of the country. Kargil has recently joined the network along with several other tiers 2 and 3 cities of India. But, Leh is unable to tap the benefit that the UDAN seeks to provide.